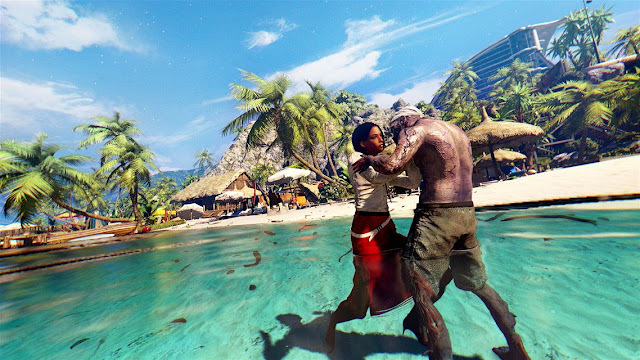 Had you asked me my feelings on the Dead island series before this release of the brand new upgraded collection, there is a high chance you would have been met with a face like I was eating a bee and not much excitement in word form coming out of my mouth. While the series did nothing for me and many others when the original game released back in 2011 and Riptide following in 2013, I think it's fair to say the series still has its own unique fan base who enjoyed what the game offered them back then. I had in truth wrote off the game before even playing this new shiny take on slaying the undead, which was bad on my part, as it turns out all is not bad. This remastered collection nets you three games in total, with the original Dead Island, follow up Riptide, and also a game called Retro Revenge being the three games you get for picking up the bundle. Now many would be happy paying £40.00 for three games I imagine, but it gets even better. You can pick up all three games on a bundle disc for around £20.00+ if you have a good look around the Internet, but even going digital on the Xbox store sees it costing just £24.99. If you want to pick up each game on their own however, you can if you want to pick up Dead Island or Riptide for just £12.79 as a singular download. This review will only see me talking about both Dead Island and Riptide, as due to an issue at my end with my digital copy of Retro Revenge not unlocking until August 1st on my console, I sadly cannot give my thoughts on that part of the game. I will of course return to this review an add it in once the game unlocks however. Starting with Dead Island, my most played game in the collection. 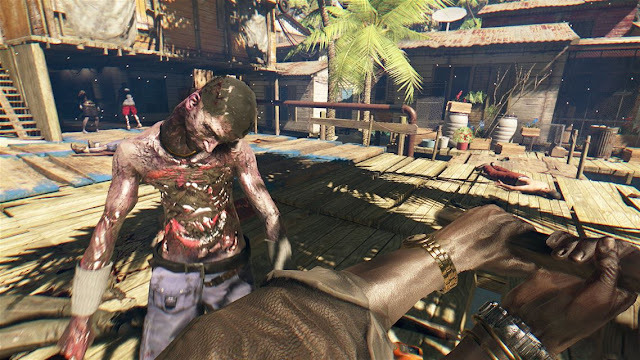 I've kind of been a bit surprised in how much I've enjoyed Dead Island and what it has to offer. Its very much got that Dying Lying feel and look to it now, but I'm still unsure if just my taste in games has changed since playing the original, or maybe I was just to hard on it first time around. The game kicks off with a fancy intro of a concert setting at this resort you are staying at, with the game properly kicking off just after when you awake in your hotel room to distant screams and a emergency recording over the tannoy telling you to leave your room and hotel as soon as possible. It's not long before you come across others at the hotel who sadly are not doing too good, and have been took over by this plague that is sweeping the island. Thankfully however, you also come across others who are not infected, and the game then goes from there with you exploring the island to do missions for others, while at the same time trying your best to survive the hordes of infected that litter this picturesque place While the character you choose to play is immune to this plague though, this doesn't mean an easy ride for you. As those infected still want to munch on you flesh like you are the meat side of a Sunday roast. You get to choose from four characters to play through the game with, all of which have a certain weapon that they favour. Logan is a throwing expert, Purna loves firearms, Xian likes sharp weapons, and Sam B wrapping things up who loves all that is blunt. All these characters have a short back story to tell before you pick them too, but I went with my gut for this review and decided to just click on Xian. You also have an extra character for Dead Island who has a small campaign of his own called Ryder. This guy also has 100% stats on the three listed, those being health, speed, and stamina. All the other characters have the same three stats, but all of those have one stat that differs from the other, with one always being either in the 80% or 90% region. Like I said earlier, both game are very much your standard go here and do that, go there and get that walking dead experience that we'e come to expect from games like this now.That being said Dead Island for me has been enjoyable, with Riptide on the other hand being a game I'm yet to enjoy like I have done Dead Island. The combat is still a little off sometimes, and the voiceovers and script still make you feel like you are watching a cheesy movie. But the fun you have slaying these flesh eaters is still enjoyable, and the gorgeous setting of it does indeed look better than ever. Soon enough your driving around mowing down dead people and kind of just enjoying yourself, which in turns sees you ignoring any small fault either game has. 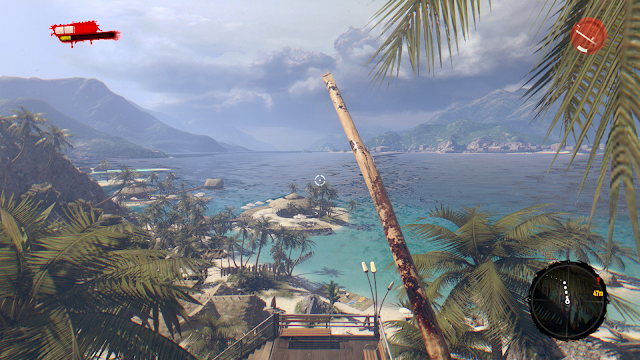 Now while Dead Island has been a blast to play through so far, sadly I can't say the same for Riptide. Something about the game just doesn't right with me, and after replaying the part after the opening section which sees you on a ship, I quickly remembered why Riptide didn't stay very long in my collection. While Dead Island kinds of eases you into the game and how to play, Riptide does the opposite and throws you quite quickly into a swarmed camp that is covered with a ton of enemies, with hardly any weapons to your name. Once I got past that part of the game, much like I did on the 360 I'd already stopped having fun. So while I've seen myself sinking a decent amount of time into Dead Island, I still can't see it being the case for Riptide once this review is up and out. Another good point in both games however is the crafting system, which sees you picking up bits and pieces to craft some sort of demonic weapon to cave the heads in of the people trying to eat you. Now we're not talking Dead Rising levels of fun here, but still something good enough to keep things ticking along nicely at a decent rate of fun.You can also play the game in one punch mode, which sees you kicking these enemies almost across the map with some funny ragdoll physics making it a bit of fun if you fancy just ploughing through the game not caring about achievements and challenges. Overall: A decent bundle at a great price. 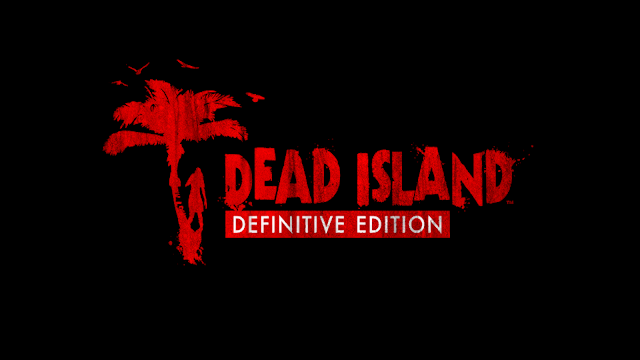 While Riptide still isn't my cup of tea, I have come out playing the collection having enjoyed Dead Island, something when installing the game I didn't think I would be typing in the final review.